After making pancakes with it, I experimented with my leftover ricotta and found my way to this easy dessert. 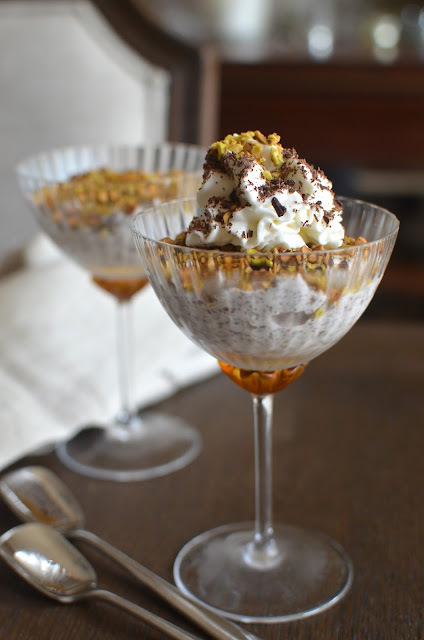 Think Sicily, and think cannoli filling because this pudding is simply sweetened, drained, ricotta mixed with grated chocolate and topped with pistachios. Could it be much easier than this no cook/no bake dessert? When I saw this recipe from Nick Stellino for ricotta pudding, I was intrigued and knew what I wanted to do with my remaining ricotta. Before putting the pudding together, place the ricotta in a fine mesh sieve for about an hour to drain and remove the excess liquid. Then, all you have to do it stir the ricotta with sugar to sweeten it, then blend in some finely grated chocolate. 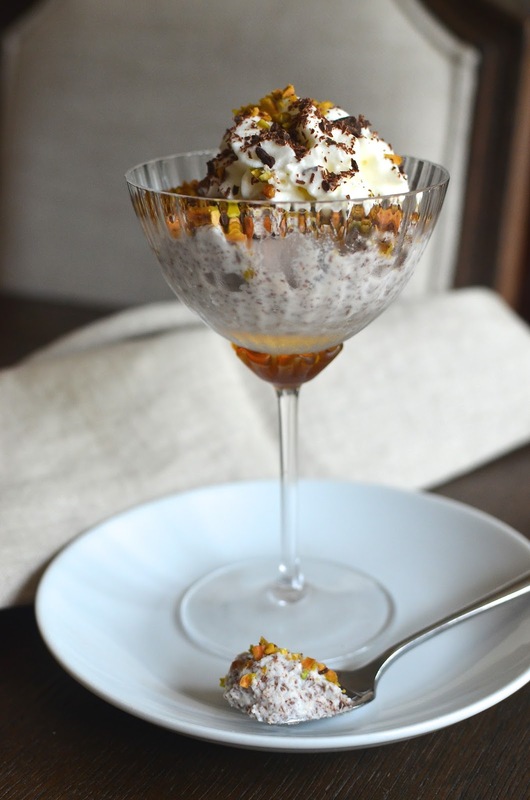 Spoon it right into serving glasses and top with some chopped pistachios. It's quick and easy, and makes for an elegant yet simple dessert. It's also a great make-ahead. Serve as is, or top it with a little whipped cream and sprinkle a bit more of the grated chocolate and chopped pistachios on top. A maraschino cherry on top of the whipped cream is a fun alternative, too. This was an easy and fun dessert to make. The pudding might be a bit on the dense side but that made it satisfying. We liked the mild sweet creaminess of the ricotta and of course, stirring the chocolate into it almost turned it into chocolate ricotta. The topping of pistachios added the crunch that I think I enjoyed most. * About an hour beforehand, strain the ricotta to eliminate excess liquid by placing it on top of a fine mesh sieve. Place drained ricotta into a bowl. Give the ricotta a good stir or a light whisking to eliminate lumps and lighten it a bit. Stir in the sugar and blend thoroughly until incorporated. Stir in all but a tablespoonful or so of the chocolate (reserving some for topping) into the ricotta. Divide the ricotta pudding between 2 serving glasses and top each with pistachios, reserving about a tablespoon for topping. If not serving immediately, cover glasses with plastic wrap and place in the refrigerator. To serve, top ricotta pudding with whipped cream and sprinkle some of the reserved grated chocolate and chopped pistachios on top for garnish. An easy fun dessert with lots of awesome ingredients...absolutely irresistible! Where has ricotta pudding been all my life?! Thank you, Monica, for introducing me to this luscious sounding dessert! Puddings and fillings are my favorite desserts. I even have rice pudding instead of cake on my birthday every year. :) I know....a little crazy. I think the best part of cannoli is the filling, so eating a bowl full sounds heavenly! I had a similar feeling when I saw this recipe...a bit of disbelief that it could be so easy and also an "ah-ha" kind of feeling of it makes perfect sense. I love how you enjoy rice pudding instead of cake for your birthday. I like to have ice cream (like sundaes) for mine but I end up having a few things! Anyway, this dessert sounds right up your alley if you love fillings. Hope you try it. It's too easy not to! This is too delicious sounding. I absolutely adore ricotta and this would be so so tasty. I might have to make this, looks easy too. It's a no-brainer if you enjoy ricotta to begin with. It's so easy and looks like more work than it is. Enjoy the holiday season! I certainly never thought of it either but I somehow stumbled on the recipe and I had to try it given how easy it was and that I had ricotta on hand. It's a lovely little pudding. Thank you, Tricia. Wow! This dessert could not be more easy. Love that. I think that could even convert this to a keto-friendly dessert with a few adjustments. Thanks for the inspiration Monica! I had to look up keto-friendly. You're a wiz with recipes so I'm sure you can make it better. It really is very easy and a little can go a long way and feel satisfying. This looks delicious and it sounds so delicately flavoured, just the thing for a light dessert. Love everything about this one Monica, it's delicious, elegant and easy, the perfect dessert. Very much like a cannoli...I especially like the idea of the whipped cream and pistachios topping. Exactly. I also like the crunch and whipped cream "lightens" the texture. What a delicious easy sweet delight! Isn't it great when something is easy?! Ricotta pudding looks so pretty and delicious, Monica. Chocolate and ricotta is a lovely combination. Love how beautifully you have flavored it. Wonderful share. Oh man, my family would go NUTS for this pudding!! And I am loving the sound of it as well! I hope you had a wonderful Halloween Monica!! Your lovely Italian family just might enjoy it! : ) Glad you like the look of it. Halloween has come and gone - how does time fly by so quickly! I’m obsessed with Ricotta and Pistachios.This looks so wonderful and yummy and I ma thinking to make it this Friday! That's fabulous. Hope you give it a try...it's too easy not to. This dessert is making my mouth water! And your photos are gorgeous, Monica! Ohhh! Didn't know ricotta pudding exist at all. Like you said, it's the perfect way to use up leftover ricotta. And it's easy to change up the toppings for what you have at home. Bravo! Same reaction here when I saw the recipe! But it makes total sense when you think of a cannoli...and so right you can top it with things like crushed biscotti or amaretti cookies, other nuts, etc.